*This post is 100% not affiliated with Kotaku. It is my personal feelings about a day that is slowly being forgotten. 24 years ago today, a group of students marched onto Tian'anmen Square to protest and grieve over the death of Secretary General Hu Yaobang. The resulting peaceful protest was deemed an all out assault on the ruling party's hold on power and was subsequently quelled. 24 years later, it is slowly being forgotten. On December 8, 1941 US president Franklin Delano Roosevelt delivered a speech to the US Congress. In his speech he said seven very famous words: "A day that would live in infamy". What exactly did FDR mean by that? One can say that FDR wanted a day of terror, to remain in the annals of history, forgiven or passed over but not forgotten. The day that FDR spoke about is taught to most US school children. So what does Pearl Harbor and Tian'anmen Square have in common? The correlation is that both are events that should be remembered. Where the two events differ is that Pearl Harbor isn't forgotten, it's just not as important, whereas Tian'anmen is made to have never existed in the first place. On June 4, 1989 thousands of university students and citizens of the People's Republic of China had gathered at Tian'anmen Square, the public square where Mao is entombed as well as the first entrance to the forbidden city. The protesters had been peacefully protesting, requesting dialogue, for close to a month despite the fact that martial law had been declared in the Northern capitol. It was decided on June 4, that the protest can not last any longer, the order to clear the square was given. In the process of clearing the square - hundreds of unarmed protesters died. There is no accurate number. Some sources list numbers as high as 1000, others list them as low as 180. It's taking a while to get to the point of this entry. The point is Tian'anmen square is a nearly forgotten and replaced incident in the history books. This might get worse as China becomes more powerful but that is all speculation. 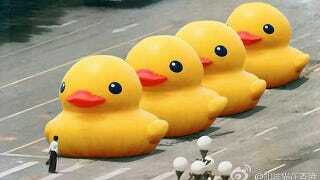 Normally on the anniversary of Tian'anmen the internet in China comes to a standstill. The censors move at all time speeds blocking any mention or anything close to mentioning what happened on June 4. However this year, the 24 year anniversary, the internet feels fine. Speeds are good, vpns are operational. The censors are at full force but the internet isn't bogged down, web searches bring up results (albiet wrong ones) and the day was largely business as usual. What does this mean? Perhaps it means what many academics have put out on twitter - the day is forgotten. Many college students, grad students today weren't even born 24 years ago. Their parents don't talk or teach them about what happened 24 years ago and they don't learn about it in school. US Students might learn about it, but because there's not enough uproar from the Chinese, Tian'anmen may be lost in the wind. Hong Kong and Taiwan maybe shouting, but their voices may not be louder than the voice of the mighty Yuan that is slowly and surely gaining value. In a few years, a day which should live in infamy, might just end up being forgotten.